Dr. Johan Botes is known for his extraordinary versatility as a soloist, collaborative musician, and teacher; a career which has brought him recognition in concerts around the world. A native of South Africa, Botes showed musical promise from an early age. Among many notable awards in his native country, he was the 2007 First Prize Winner of the Third UNISA/Vodacom National Piano Competition playing Rachmaninoff’s technically demanding Third Piano Concerto to a standing ovation; a performance for which he also won the Desmond Willson Memorial Prize for best concerto in the final round. In 2008, Botes moved to Europe and continued his studies in London with British pianist Martin Roscoe at the Guildhall School of Music and Drama. That year also resulted in master classes with Imogen Cooper, Alexander Rudin, Paul Lewis, Leslie Howard, Leon Fleisher and Richard Goode as well as regular coaching classes with pianist Graham Johnson and soprano Margaret Humpfrey-Clark. As a soloist, Botes has performed in venues worldwide. He has appeared as soloist with the Chamber Orchestra of South Africa, Pro Musica Orchestra in Johannesburg, the KwaZulu-Natal Philharmonic Orchestra in Durban as well as the University of Pretoria Symphony Orchestra. He has also performed in Prague with the Hadrec Kralove Orchestra in 2003 and in 2005 he toured to Bulgaria where he played with the Varna Philharmonic Orchestra in Varna. In 2010, Botes won the Sidney M. Wright Presidential Scholarship Competition in Piano Accompaniment and in the same year began collaborative Piano Trio work with cellist Francesco Mastromatteo. Their first performance in October 2010 resulted in critical acclaim, winning them Prize for the best Chamber Music Recital at The University of Texas at Austin in 2011. Dr. Botes holds a D.M.A in Piano Performance from the University of Texas at Austin where he studied with Anton Nel, and a M.M from the Guildhall School of Music and Drama in London. He received another M.M. as well as his B.M. from the University of Pretoria in South Africa. Botes was Assistant Instructor for three years in class piano as well as applied piano at The University of Texas at Austin. Before that, he was a theory assistant for two years at the University of Pretoria. 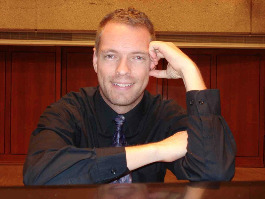 He is currently assistant professor of piano at Marshall University.